William “Bill” Patrick O’Connor was born in Vermillion, SD, on October 16, 1949 to parents Michael & Aileen (Ryan) O’Connor. Bill grew up in the Garryowen area, attended Walnut Grove Elementary School and graduated from Akron High School. Bill helped work his family’s farm until he enlisted in the United States Marine Corps in 1967 and honorably served his country. After returning home, he married Paula Hubert in 1977, began his farm, and started their family. He worked days on the farm and welded at night to provide for his family. Bill was a visionary, hard worker, entrepreneur, husband, father and grandfather. He was a self-made man who believed hard work would get you anything. 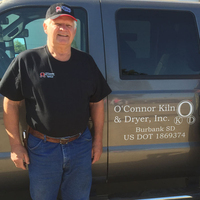 After years of working two jobs, Bill founded O’Connor Kiln & Dryer, Inc. in 1998. Bill fit the mold when you think of the stereotypes associated with being Irish. He was as stubborn as they come and strong willed, but also very generous. He often plowed driveways for neighbors and was known for giving people second chances, especially those that worked for him. He would be the first person to suggest and offer to take someone to an AA meeting. Bill had many hobbies; he enjoyed cutting wood, drinking coffee, playing card games such as solitaire or hearts, riding horses and a good debate. He loved spending quality time together otherwise known as “family togetherness time”, cutting and splitting wood. He was passionate about running his business, and making the impossible job, possible. With age and grandchildren, Bill’s patience grew, as did his love for his own children (but especially his grandchildren). “Gramps” was adored by his grandchildren. His favorite games to play were hide-and seek, chasing after the kids, “throwing the kids away” and of course, “tick tock.” Gramps will be deeply missed by all of his grandchildren. Bill is survived by his wife of 41 years Paula; 4 children: Will (Burbank, SD), Shane (Burbank, SD), Carolyn (Grand Forks AFB, ND) and Don (Burbank, SD) and their families. Bill is also survived by brothers Michael O’Connor, Harry O’Connor and Tony Schneider; and sisters Audrey Harris and Peggy Donnelly. Bill was preceded in death by his parents Michael and Aileen O’Connor; brother Donald O’Connor; and sisters Connie Johnson and Judy Satiroff.